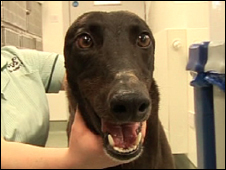 An RSCPA is investigation is under way after a greyhound was found mutilated in a "sickening act of cruelty". The animal was found on a grass verge in Bedlington, Northumberland. His ears had been cut off and electrical tape was stuck to his back and legs. He was taken to a veterinary surgery in Morpeth for treatment and is making a good recovery. It is thought his ears were deliberately severed to get rid of identification tattoos. The RSPCA is urging anyone who knows who the dog once belonged to, or who may have seen or heard anything suspicious, to get in touch as soon as possible. Inspector Ian Smith said: "This is a horrific and sickening act of cruelty. "It is clear this dog's ears have been removed by a sharp implement, which must have caused him unimaginable pain and distress. "Thankfully he was rescued early and taken to safety, else he easily could have died. "We just hope someone will now come forward with vital information to help us discover what happened."